Active AzPPA Member and co-workers or guests. Your $5 fee will be refunded when you check in at the event. Not an active member of AzPPA - Join within 30 days and your $10 fee will apply toward your 2018 membership. Space is limited for this important seminar. Register today! We know the importance of Product Safety Compliance - Now, how do we talk to our clients about it? Learn from the expert! 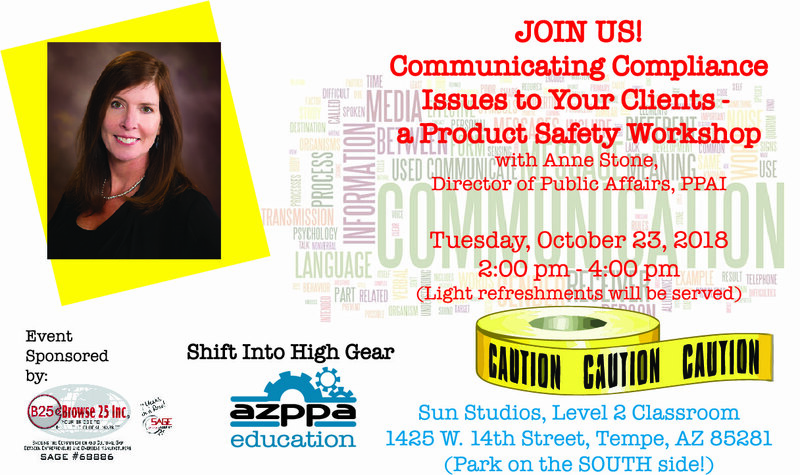 Anne Stone, the Director of Public Affairs for PPAI (the Promotional Products Association International), has been helping us to understand the intricacies of working with products that are regulated by safety policies, and the importance of staying current and informed. Now she takes us to the next level - helping us to help our clients understand this importance as well! Thank you to our event sponsor, Browse25, and all of our 2018 sponsors!